I admit that the title is a little misleading! *wink* The cost of the renovation was actually rolled into our mortgage, so we did in fact pay for it ourselves. Despite being a real estate buff since I was very little, I was not aware that these types of loans existed until my best friend drove past a ramshackle house with a big sign that proclaimed "203K Loan eligible". She called in absolutely excited, as both of us had dreamed of being able to personalize our own spaces. The 203K is a FHA (Federal Housing Administration) loan that rolls the cost of the renovation into your mortgage. It opened up a huge swath of possibilities and houses we had seen in our price range! As of 2018, there are also conventional versions of this loan down to 5% for single family homes and 15% down for duplexes. The conventional versions are a little easier than the FHA version. The FHA won't lend on homes that require repairs and most sellers are loathe to make the necessary repairs. If you are using FHA financing, this eliminates many homes from your house search. The FHA requires that all of the following issues be addressed prior to closing : "health and safety issues, physical deficiencies or adverse conditions that affect the livability, soundness or structural integrity of the property. The nature and degree of any health and/or safety issues will determine whether to address said deficiency in the narrative comments area of the report under “condition of the property”, or “physical deficiencies” affecting livability or structural soundness." The issues could be as little as cracked tile on the floor and as much as a termite infestation. The 203K loan bridges that gap and allows you to purchase a house that requires some work. One loan instead of two. Can be fixed rate or variable. Mortgage can exceed price of house to pay for repairs. Up to 110% of the value after improvements. Makes more houses available to regular homeowners. House may qualify for a FHA 203K that may not qualify for a regular FHA due to health and safety issues. Regular 203k loan allows for major structural repairs such as foundation work. We used the Streamlined 203K loan - which is the "mini" version, and I will be talking about the requirements associated with this particular version. It is currently called the 203K Limited loan. It lends up to $35,000 for renovations that don't involve structural repairs. You can find out more about the regular 203k loan here. We did not take the full amount but it still allowed us to renovate the bathroom, kitchen, flooring, add a patio in the yard and some other minor/cosmetic house repairs. It even allows you to purchase appliances, although we chose not to use the loan for this. The reno loan came in super handy, since the kitchen and bathroom were beyond repair. The kitchen cabinets had inexplicably been cut in half. The bathroom also had many issues. Since it was our only bathroom, it made sense to renovate it before we moved in. Like any loan process, get your paperwork in order. The escrow process goes fast in relation to how glacially slow banks move. You will become intimately familiar with who an underwriter is and what additional info they need and you may or may not be able to get them in the final days before escrow is supposed to close. Extra days to close may cost you money (look at your offer letter) and/or you may lose the house. Plan ahead! a. Scan in all documents and have them ready. Name each document with a descriptive name - for e.g. W2_2012_JohnSmith.pdf. This will make it easier for both you and the mortgage broker to process your application. b. You should be able to provide two months of bank account statements showing any money you'll be bringing to closing. This money should be "seasoned" and have been in your account a few months. If you're receiving a gift from family, make sure you have a gift letter showing that the amount is a gift and how it will be provided. In addition, you may need to show where the money was procured from for that gift (I believe this is due to the patriot act) - so your family may need to show multiple months of bank statements, as well. d. Scan in two years of tax returns. I'm not current on today's requirements and it may change by mortgage provider, but it's always good to have on hand. e. Scan in your last four pay stubs. You may need to do this right before you submit the application, so keep those pay stubs on hand or download them from your payroll website. f. Run your credit report and clean up any issues. If there is info on there that needs to get updated, get that done asap. If you can't get it done in time, get a letter from the entity that shows issues (e.g. credit card company) showing that you've resolved the issue. g. Statements for all assets. Mutual fund statements, auto titles and records of any other investments. You will need to ask for contractor bids and estimate costs for renovation (and supplies) ahead of time. We were first time homebuyers . Researching all the required renovation materials necessitated many long evenings and weekends researching and sourcing products. Make sure you understand your needs and wants, and can prioritize as needed. I had not anticipated that bathroom faucets were so costly! Also Get a comprehensive estimate that includes who pays for supplies (incl. screws and nails). Don't assume - get it in writing. You will need to find a mortgage broker who is familiar with these types of loans. It will be much smoother and you will be able to close on time if you have a mortgage broker who understands all of the requirements of the FHA 203K reno loan. They will also be able to walk you through all the steps to ensure you don't have any nasty surprises. 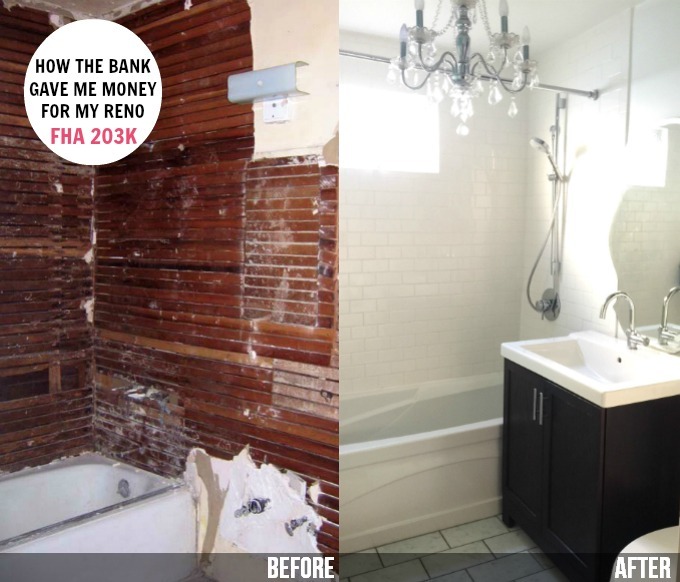 You will need to find a contractor who is familiar with the 203K reno loan. Truly trust your contractor and get multiple recommendations. I realize this is difficult because it's hard to get contractors to jump through the additional 203K hoops and agree to do the project. Take your time to find the right contractors and don't let the closing pressure affect your choices. I wish I had shopped around more for floor contractors - but I went with the first one because I was on a deadline to get the paperwork in. Make sure that they understand that it may be a few months before they get the final payment.Our contractor was not familiar with the loan and was extremely frustrated when our loan did not close on time, pushing the date of the project. The contractor receives 50% of the money upfront, so you will 1. need to ensure that you trust this contractor and keep strict tabs on your budget and timeline and 2. have a contractor that understands that the money is on guaranteed to arrive once escrow closes. As well, the final check will not arrive until ALL projects have been completed on the house. This may leave the contractor waiting a couple months for the final 50% of their fee. Having our contractor question the process made the project even more stressful than it needed to be. Find a contractor who can TRULY wait for the money - the initial 50% and the final 50%. My first contractor was so financially strapped that he had to take other jobs to make his bills instead of working on my house. The second contractor needed me to front the money for materials - money that I didn't end up getting reimbursed for after they made up bogus "additional" charges that I never agreed to. Know that the contractors (and YOU) will be waiting for their last 50% - which will NOT get paid out until EVERYTHING in the house meets the appraiser's inspection at the end of the project and the bank agrees that you are completed. All of the items on the 203k list MUST be completed to the appraiser's satisfaction. They can request additional fixes if they are not happy.We started work in March, completed the work in the beginning of May and did not get a final check until mid-June. Have a backup in case the first contractor doesn't work out. Since you've filled out all this loan information with their information - it feels like you're locked into this business arrangement. Don't forget that you're the customer and that you should run the show. Leave extra time and budget to live in your current home. The contractor estimated 3 weeks to complete the work. We waited 1 1/2 months to get the first 50% check and the contractor refused to start work ahead of time. We ended up having to move out of our place and sleep on the in-law's living room floor for a month and commute an hour to work each way (after going to check on the house after work every day). Save up your vacation time. You WILL need to be on site to approve changes and make decisions, and to move things along. I used up some vacation time to pack things at the old place, and regretted it when I ran out of vacation time and had to work late to make up for time running to the hardware store, etc. You are now on a strict timeline. That includes the time you're waiting for the first check after closing - so work that into your timeline. You should have all materials ordered and ready to go. You should have your plans agreed upon by your contractor and any permits applied for. Your significant other and you will need to agree on styles ahead of time. With time a premium once you start renovations, there is no wiggle room in your project timeline.Build extra time into your project plan. You WILL experience delays getting materials. It will rain when you need to do something outside. Someone will get the flu. The contractor will need to call the manufacturer to figure out the gosh darned fancy drain you bought, etc. You will need to set aside a fund for over budget items. Make sure that you have additional funds in reserve for additional expenses. There is always something that comes with renos. You will go over budget and your 203k budget does not have much wiggle room built in. We needed to dig deep to replace an electrical panel that couldn't handle the new kitchen appliances or dryer, and needed another $1000 to replace the old one. We didn't realize there was water damage in the kitchen wall, along with no insulation. That required a change request for more drywall work, insulation and more money. There may also be items outside of the scope of the project that you want done sooner rather than later.Leave budget for other catastrophes! My car broke down the day the first contractor quit (who was about to be fired) - which also happened to be the day before we were about to move. You will need to manage your project very closely. Type out a comprehensive project plan in Excel and get the contractors to sign it. Keep on top of it each week. Insist on formal change requests for any changes. This will protect both the contractor and yourself from misunderstandings and additional costs. We started out organized and then tapered off - which hurt us later on when the contractor hit us with additional charges that we had assumed were included.You have a lot at stake and no room for mistakes. You will need to check in with your project daily to ensure good communication with the contractor and all subs. Do not assume anything and write down detailed instructions and specifications. I create a timeline and list of projects in Excel, with line items detailed the materials to be used. Get all the contractors together to agree on a schedule. The contractor agreed to having the flooring contractor get started on the damaged hardwood floors. When the flooring guys showed up, the contractor threw a fit and yelled at them to leave. We not only lost time, but also the goodwill of the flooring guys. You will need to employ a licensed contractor for much of the work. "Mortgagees must also ensure that the selected contractor(s) meet all jurisdictional licensing and bonding requirements. The mortgagor must use one or more contractors to complete the repairs. “Self-help” arrangements, in which the mortgagor performs the work, are not to be approved unless the mortgagor can sufficiently demonstrate that he or she has the necessary expertise and experience to perform the work competently (e.g., mortgagor is an electrician and will perform electrical repairs/upgrades to the property)" HUD website". We were able to work on grading the yard and building the patio ourselves, but we needed a contractor licenses in LA for the other work.As well, the underwriter will ask for a bid to complete the project in case you can't complete it. For example, we excavated and laid a patio - and were reimbursed for the materials (pavers, sand, gravel, etc). We provided a bid from the contractor in case we couldn't complete it. Keep in mind that your total including that bid needs to come in under your total (e.g. under $35k for the streamline 203k). You will need to be organized. Shop around for deals on supplies. I bought a number of items online. Make sure to keep receipts in a safe and easily accessible place - you'll need those to be reimbursed. As well, keep a running tally of all costs in an Excel sheet in Google docs. That made it easier for me to update from work and from home. I bought a little accordian wallet to keep all my house-related receipts to ensure that I kept everything safe. You may need a storage space near your new house. I thought that we could move all our stuff into the garage while the contractor completed the house. Unfortunately, the contractor needed the space to store additional materials and tools. Be prepared to pay extra money for PMI. PMI (private mortgage insurance) is an extra policy that you pay for on a loan, when you put down less than 20% down. This extra insurance policy reimburses the mainly mortgage company should you default.As of today, you will need to pay a fee of 1.75% of the purchase price to the FHA at the time of closing (Up Front Mortgage Insurance Premium (UFMIP) – financed into the total loan amount at the initial time of funding), along with an annual MIP fee which is spread over 12 monthly mortgage payments. This current fee is significantly higher than what we paid, and makes the loan slightly less desirable. We were able to refinance out of the FHA loan a couple years later, into a convention loan and also out of PMI since our improvements increased our equity by more than 20%. If we had refinanced earlier, we would have been refunded a pro-rated amount of the Upfront fee. Check with your 203k mortgage expert to see if this is the case today. You will need to set aside many of your hobbies and outside interests for a few months. The renovation process, time to oversee the project, projects that we personally had to complete within the 6 months and the overall stress and lack of money resulted in a lack of social life for a few months. Friends were invited to bbq in the yard and sit on folding chairs, while chugging cheap red wine. They were welcomed to pick up paint brushes or help demo tile. Our hobbies fell by the wayside, which was fine because we fell into bed exhausted each evening. Since we were also living in one room in the house during most of the renovation, the stress and coordination needed to ensure a presentable outfit for outings was not always possible. Drywall dust was now an accessory. Your relationships will be severely tested during this time. The stress of adhering to a strict list of renovations you submitted to the underwriter and mortgage broker makes this renovation even more stressful than a regular renovation. The appraiser will be coming by at the end of the six months to ensure all of those items are completed. All walls must be painted and every last punch list item must be checked off. Perhaps you find yourself with a less than satisfactory contractor but are locked in due to budget and time constraints that would cause you not to be able to meet the FHA deadline. Perhaps your contractor takes on a partner with a drinking problem. Perhaps your contractor quits and leaves you with the problematic partner to finish the job by the deadline. Now is the time to nurture your relationship, and those cases of Two Buck chuck from Trader Joe's. If you can weather this renovation, your relationship will be that much stronger! DO find time to relax. Go get a mani/pedi. Spend quiet time at the bookstore. Do something fun. Remodeling on a budget will be one of the most stressful things that you will ever do. And some contractors will make it even more stressful. Prepaid items/reserves (incl. prepaid interest, hazard insurance,etc) - This was $3500 for me. was $0 for me. I did not get to keep the extra. At the time, the HUD-1 and Good Faith Estimate were not clear as to the funds needed for closing. I was surprised by the extras, which delayed finishing half of the kitchen until we could afford the rest of the cabinets. The final verdict? Would we do it again? This was the only way we could afford a house - so we're happy we did it and grateful for the program. However, we would plan ahead to do our due diligence well in advance and pick extremely professional contractors. After working at a more leisurely pace with more professional contractors on other house projects, we see how much less stressful projects are. Disclaimer: this was my personal experience with the FHA 203k loan. Your mileage may vary. Do your own research and contact your local 203k expert for more information. Also, this post contains affiliate links. I may make a small commission to keep this site running, at no additional cost to you. The links I use can work for any website, so I only link to what I feel is valuable and does not affect my opinion.